The Lamplighters are the Past State Presidents of the Kansas State Council. 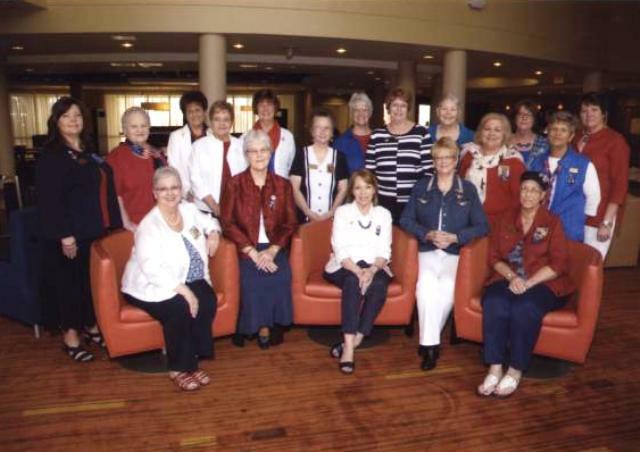 Over the years this group of women have, for the most part, remained active in ESA. They give their support and encouragement to future leaders of ESA. The group acts as mentors and when needed they are ready to provide the needed support to ESA sisters. A Lamplighter president is elected each year and serves on the Board of Directors of the KSC. Their money making projects have supported many projects of the KSC and in particular the Endowed scholarships. They established and support the Memorial Lamplighter Endowment. In order to run for elective office on the International Council one must have served as a past state president. Kansas has had several of its past presidents earn the high honor of International Council President who leads all of ESA. Lamplighters meet once a year to plan their ways & means to support our projects. Their attendance and support of the Kansas State Council is always very good at meetings. 1946-1947 - Zura Crockett Ditman (Deceased) "The Hands of Friendship"
1947-1948 - Zura Crockett Ditman (Deceased) "The Open Road"
1948-1949 - Pauline Cowger (Deceased 1990)"Finding Ourselves: Education-Sisterhood-Achievement"
1949-1950 - Grace Stoner (Deceased) "Hitch Your Wagon to a Star"
1950-1951 - Mildred Doll Keller (Deceased) "Seeking Treasures in ESA"
1951-1952 - Jessie McAdoo Little (Deceased 1999) "ESA in Wonderland"
1952-1953 - Beryle Elliott (Deceased 2010) "Ad Astra Per Aspera - To the Stars with Difficulty"
1953-1954 - Fay Jordan (Deceased) "Cooperation the 7th Pearl"
1954-1955 - Katherine LaVelle (Deceased 1999) "Friendship - Our Anchor"
1955-1956 - Irene Ramsey (Deceased) "Somewhere Over the Rainbow in the Land of ESA"
IC PRESIDENT 1966-1967 "ESA Hands in Many Lands"
1956-1957 - Hazel Hayes "Happiness"
1957-1958 - Jerry Phillips "A Gay & Gallant Heart"
1958-1959 - Mary Booe (Deceased) "Around the World with ESA"
1959-1960 - Mildred Foley "The Praying Hands"
1960-1961 - Lois Mayall (Deceased 1992) "To Serve the Present Age"
1961-1962 - Betty Guthrie (Deceased 1970)"Symphony of ESA"
1962-1963 - Louise Woods (Deceased June 2013 )"A Better World Begins with Me"
1963-1964 - Bonnie Gunter (Deceased 1992) "A Smiling Heart"
1964-1965 - Velma Harness "Reach for a Star"
1965-1966 - Dee Quade Hyle (Deceased January 30, 2015) "Sea of Service"
1966-1967 - Katy Tyler Mills "Friendship in Orbit"
1967-1968 - Kathleen Lutz (Deceased)"Memories of ESA"
1968-1969 - Gladys Shook (Deceased 1972) "It's the Little Things that Count"
1969-1970 - Lorita VonNiederhausen (Deceased 1986) "The Art of Beautiful Living"
1970-1971 - Maxine Koerner McKeever "The Key to Tomorrow is Today"
1971-1972 - Anne Fields Langenfeld "The Dawning of A Great New Day"
1972-1973 - Jean Wells (Deceased) "ESA in Panorama"
1973-1974 - Betty Spicer "Silhouettes of ESA"
1974-1975 - Dorothy Keenan "Share the Bouquets From Your Garden of ESA"
1975-1976 - Mary Daniels (Deceased) "Jeweled Harmony - Our ESA Heritage"
1976-1977 - Florence Ellis (Deceased) "ESA in God's Wonderful World"
1977-1978 - Joan Friend (Deceased October 2014) "Beyond a Dream ... Circles of ESA - Love, Hope, Friendship & Giving"
IC PRESIDENT 1989-1990 "ESA Memories Opens Doors"
1978-1979 - Opal Regier (Deceased) "The Reality of Sisterhood in ESA"
1979-1980 - Joyce Marrs "Take Time"
1980-1981 - Jean Beetem (Deceased) "Light Up Your Life with ESA"
1981-1982 - Judy Ary "Reach Out and Touch"
1982-1983 - Marilyn Herren "Happiness IS...ESA"
1983-1984 - Geri Benton (Deceased June 2016) "Let the Sunshine In"
1984-1985 - Joan Bourn Treasures from the Sea"
IC PRESIDENT 1998-1999 "Seek the Treasures of the Sea"
1985-1986 - Kay Ross "For All Things, A Season in ESA"
1986-1987 - Verneene Forssberg "ESA, The Wind Beneath Our Wings"1987-1988 - Shirley Campbell "ESA - An Adventure"
1988-1989 - Coleen Cape "ESA ... a love Song"
IC PRESIDENT 2004-2005 "Embrace the Power - Free Your Spirit"
1989-1990- Kay Foster "Clownin' Around in ESA"
1990-1991 - Charlene Hansen"ESA ... God's Hands"
1991-1992 - Margaret Shook "ESA ... Super Star"
1992-1993- Donna Dawson "ESA ... The wings of Love"
1993-1994- Shelah Goyer "ESA ... A Carousel of Hopes and Dreams"
1994-1995- Susan White "ESA ... A Place in the Heart"
1995-1996- Mary Hill "We are the World"
1996-1997- Helen Stitt "ESA PANDAmonium"
1997-1998- Karen Lowery "Earth's Special Angels"
1998-1999- Cindy Rodman "The Power of the Dream"
1999-2000- Linda Schmidt "We've Come A Long Way Baby"
2000-2001- Connie Hoch (Deceased: 2008)"ESA: The Gift that Keeps On Giving"
2001-2002- Susan Winters "ESA ... Magic in Motion"
IC PRESIDENT 2012-2013 "ESA It's Magic"
2002-2003- Phyllis Wheaton (Deceased: 2010) "ESA .. My Cup of Tea"
2003-2004- Maureen Wells "ESA ... A Patchwork of Memories"
2005-2006- Denise Masterson "ESA ... The Colors of the Wind"
2006-2007- Charlotte Combs "ESA ... A Beacon of Hope"
2007-2008- Pam McElvain "ESA ... Love, Laughter, Leadership & Service"
2008-2009- Joy Thornburgh "ESA ... Free to be ..."
2009-2010- Pat Josey "ESA ... The Sweet Life"
2010-2011- Kim Kummer "Let your Life Speak" IC PRESIDENT - 2018-2019 "ESA ... A GIFT"
2011-2012- Marsha Barnes "Seasons of ESA"
2012-2013- Phyllis Simmons "ESA-USA The Heart of it All"
2013-2014- Judy Ahrens "ESA-On with the Show"
2014-2015- Bonnie Templeton "The Many Hands of ESA"
2015-2016-Angie Fairbanks " ESA - Anything is PAWSible"
2016-2017-Jill Richards "ESA - Making a Difference"
2017-2018-Ruth Archambeau "Angels Among Us"
ESA began as a National Reading Society in 1929 by Adelia Prichard. It was a time of the roaring 20's and the fateful stock market crash which will plunge America into a deep and painful depression. Dr. M. Freeda Lotz was the very first president of a chapter chartered in Colorado. The depression didn’t seem to hamper the growth of ESA as it reached 38 states with 400 chapters during the 30s. Although the depression will most profoundly impact the financial policies of the organization and most likely as a direct result of the economic situation ESA chapters began to donate a lot of time and money to philanthropic activities. Nationally ESA members, like others, lived their lives under the New Deal in the 30s and 40s. It was a time for small advances for women as Frances Perkins became the first female Secretary of Labor on FDR’s cabinet. Kansas chapters were formed in the 1930s in Hutchinson, Salina, Topeka, and Wichita. The first chapter to be chartered was Omicron from Sauna chartered in 1930. Two of the original chapters still remain active today: Iota Kappa and Iota Mu in Wichita. Operating without a Kansas State Council, chapters of the 30's seldom, if ever, joined each other in group functions. As a reading society, the 1930s membership was sure to pick up the Pulitzer Prize for Literature by John Steinbeck called, “The Grapes of Wrath.” Lady Lindy - Amelia Earhart - became an American Heroine by becoming the first female to fly the Atlantic solo. While the movie screens were filled with Shirley Temple, Greta Garbo, and John Berrymore, Adolf Hitler was winning widespread following for his National Socialists in Germany. “Babe” Didrikson and Jesse Owens, remarkable sports stars of the 1930's, will lead America to gold in the 1932 Olympics under the watchful & critical eye of Adolph Hitler. Kansas has taken its place from the beginning supporting the efforts of the Epsilon Sigma Alpha. The original headquarters was established in Kansas City. The National convention was held in Kansas City at the Muehelbach hotel in 1938 where two of our local women were installed as national officers: Phillis Kimmell from McPherson, Kansas was installed as 2nd Vice President and Beulah Metz from Kansas City was installed as Recording Secretary. This was also the convention that May 1 was established as Founder’s Day for ESA.